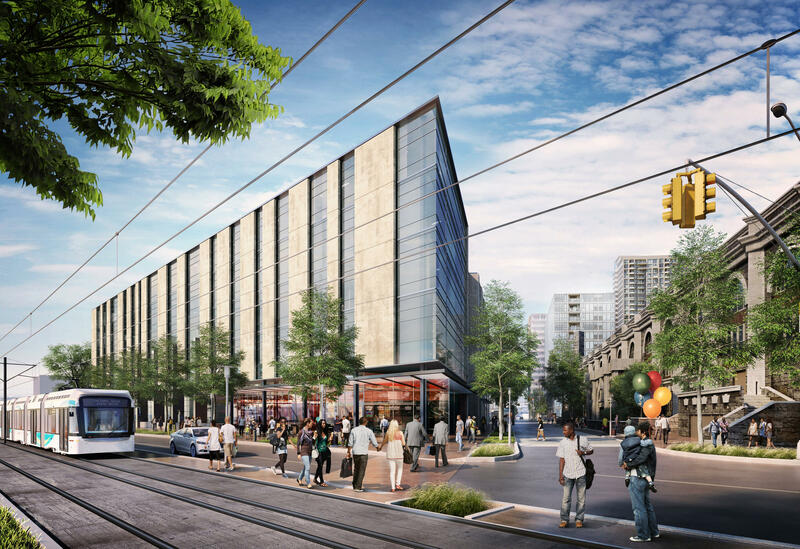 A rendering of the existing plan for redeveloping State Center in Midtown Baltimore. Commissioned by the Maryland Stadium Authority and performed by Crossroads Consulting Services, the study looked at other cities to determine what would be most likely to succeed. Some of the top options include office space; a 25,000-square-foot grocery store; fast food; apartments; a convenience store and gas station; casual dining, such as Ruby Tuesdays or Applebees; and a concept restaurant, such as a microbrewery. The study describes itself as a “a cursory market evaluation of potential future uses.” It does not include the in-depth analyses that would be necessary before the state can greenlight a new plan, and it does not give a strategy for moving forward. But the initial suggestions are markedly different from the plan in place for many years. That plan began growing in 2005, under Gov. Robert Ehrlich’s administration. The plans were put on hold indefinitely when the Board of Public Works voted at the end of 2016 to cancel the state’s leases for office space at the site and Gov. Larry Hogan’s administration sued Moore’s team. The board said the leases were too expensive and would have put the state over its debt limit. Despite the delays, General Services Secretary Ellington Churchill reaffirmed Hogan’s dedication to the project during Tuesday’s meeting. “The governor has stated on the record many times that the administration wants to move forward with the sensible redevelopment of state center and it has been a priority of the administration since day one,” Churchill said. Residents in the nine neighborhoods surrounding the development have been involved from the beginning. Starting over from scratch with the new ideas suggested in the study disregards the input the residents have given over the years on what they want to see at the site, John Kyle, president of the State Center Neighborhood Alliance, told the lawmakers. The area is considered a food desert, and residents say a grocery store is desperately needed. They also say they need a bank, something the study gave a low probability of success. She attributed the desire to give up on the State Center plans, at least in part, to racism, as the neighborhoods around State Center are predominantly black. Del. Cheryl Glenn, a Baltimore Democrat and chairwoman of the Legislative Black Caucus, compared the delays in the State Center development with Hogan’s decision to cancel the Red Line light rail project. She said she plans to introduce legislation in the next couple of weeks that would require the state to move forward with the State Center development as planned. It’s not clear how much effect the legislation could have before the state’s lawsuit wraps up.